Strictly speaking this blog is about my work as an artist . 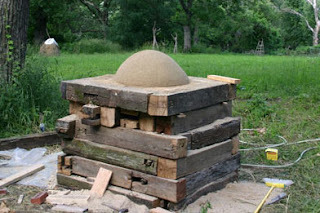 . . but occasionally the sculpture has other uses, in this case a wood-fired clay pizza oven. The sand dome (above) is standing on a hearth of fire bricks that came from the demolished East Side school in Decorah. An organization was formed to recycle the re-usable building material, Oneota Historic Future Alliance – East Side Material, and I was fortunate to find enough bricks for the hearth among the piles of salvaged rubble. The plinth is made from some of the old oak beams saved from our barn renovation. We dug some clay and mixed this with sand and water with our feet – a wonderful pedicure – here we are testing the clay to ensure it is the right consistency. We used the clay to make adobe bricks which were laid over the newspaper-covered sand dome. Learning to read and draw Hebrew letters is a challenge. My initial attempts to copy an alphabet were soon thwarted by my unwillingness to be bound or restrained by the strict laws governing the formal writing of letters. I am not destined to be a Sofer (Jewish scribe). 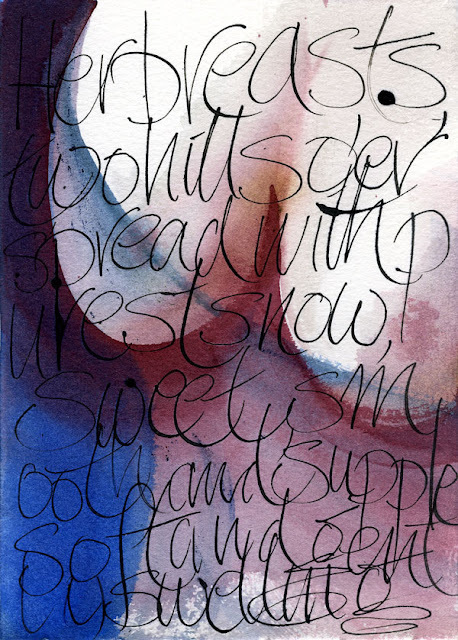 Nevertheless, the letter forms and language remain fascinating. The four abstract drawings here are based on my practice pieces. The first (above) presents a conundrum: while creating a satisfying abstract design, I didn't realize until I was 'finished' that the letters were upside down! This begs the question: how is the reader of Hebrew going to interpret this? Do tell me. Seeking a more lyrical solution I made a number of composite drawings using a broad brush and nib pen. Again it is the word בְּרֵאשִׁית‎, (Bereshit) meaning Genesis, or 'in the beginning'. Thomas Carlyle in Heroes . . . makes reference to 'Arundel-marble', obliquely referring to the Parian Marble or Chronicle, an early Greek chronological inscription. It is just possible to decipher the words in the continuous string of incised capitals, and colour helps in this calligraphic rendering of one typical entry. 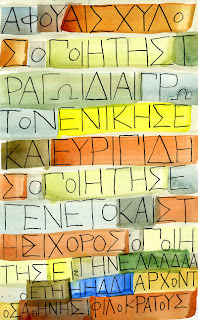 Treating the letters with less reverence [perhaps] and injecting some lyricism it is harder to read, but only if we read Greek, so does it matter if it is almost illegible? Perhaps not, as its purpose is chiefly to be a decorative foil and accompaniment to the text. What is lost is any suggestion that the source of the text were letters are carved in marble. The inscription translates as: 'From when Aeschylus the poet first won with a tragedy, and Euripides the poet was born, and Stesichorus the poet [arrived] in Greece, 222 years, when Philocrates was archon in Athens'. It dates to around 850 BC. A few images from a new project: bibliographic references in Thomas Carlyle's Sartor Resartus and On heroes, hero-worship and the heroic in history. Having discovered that Borges was inspired by Sartor I too began reading and found among his allusions and quotations much that was amusing and inspiring. In particular, his references to books and printing, that I now propose to present in book form (both digital and conventional), illustrated with a selection of quotations by Carlyle's 'cast of players'. Torquato Tasso describes the enchantress Armida in his sixteenth-century poem, Jerusalem delivered.